Hey, so I haven't been on this site for ages, and yet design wise I'm the busiest I've ever been. I'm working alongside my brother starting up Thunder and Plunder. What is Thunder and Plunder you may ask? It's a statewide biker magazine for Florida, that's on a DVD instead of print, as well as a website. In between coordinating different projects for that, I'm currently in charge of our CafePress store. That's where Misery Luvs comes in. Part of the store is dedicated to my ML designs, alongside whatever I create for T&P. 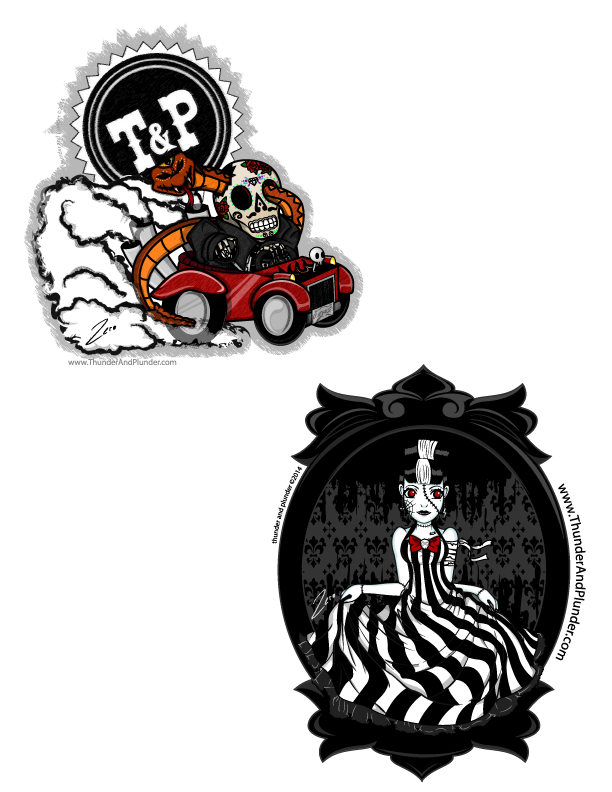 So for all your new ML design needs check out my new online store at Thunder and Plunder Garage and look under the Misery Luvs tab! Even more new designs to follow. I am the artist known as Junkyard Girl. I am a creator of the wonderfully weird, charmingly odd, and morbidly cute. Current fascinations include grim reaper plushies, cute skulls, and the creatures that go bump in the night.